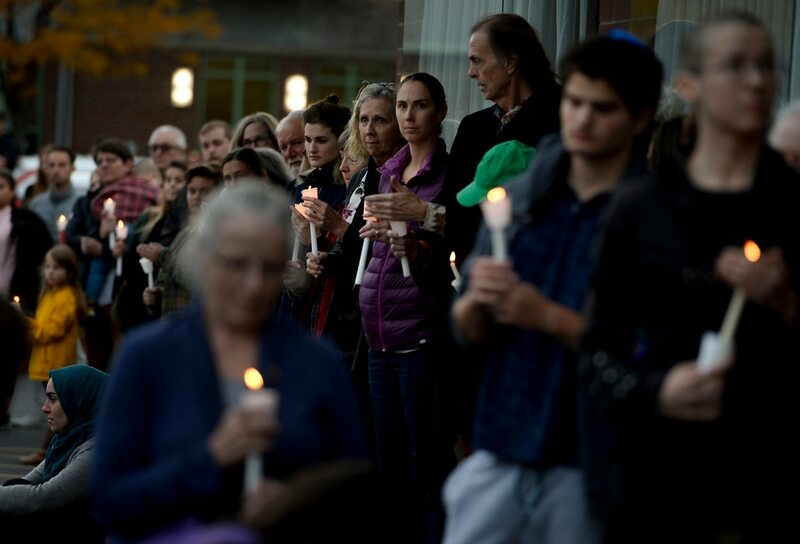 Leah Hogsten | The Salt Lake Tribune Vaughn Lovejoy, center, joins fellow community members outside Chabad Lubavitch of Utah as members of Utah's Jewish and interfaith communities hold a vigil and prayer service, Monday, Oct. 29, 2018 for the 11 people killed at the Tree of Life Synagogue in Pittsburgh. Leah Hogsten | The Salt Lake Tribune Candles are lit outside Chabad Lubavitch of Utah as members of Utah's Jewish and interfaith communities held a vigil and prayer service, Monday, Oct. 29, 2018 for the 11 people killed at the Tree of Life Synagogue in Pittsburgh, Monday, Oct. 29, 2018, for peace, harmony and love to once again reign supreme upon this Earth. Leah Hogsten | The Salt Lake Tribune Holocaust survivor Abe Katz is aided by Rabbi Avremi Zippel as 11 candles representing those killed during Saturday's shooting at the Tree of Life Synagogue in Pittsburgh are remembered during an interfaith service at Chabad Lubavitch of Utah, Monday, Oct. 29, 2018. Hundreds attended the vigil and prayer service to pray for peace, harmony and love to once again reign supreme upon this Earth. Leah Hogsten | The Salt Lake Tribune Candles are lit outside Chabad Lubavitch of Utah as members of Utah's Jewish and interfaith communities held a vigil and prayer service for the 11 people killed at the Tree of Life Synagogue in Pittsburgh, Monday, Oct. 29, 2018. Leah Hogsten | The Salt Lake Tribune Candles are lit outside Chabad Lubavitch of Utah as members of Utah's Jewish and interfaith communities held a vigil and prayer service, Monday, Oct. 29, 2018 for the 11 people killed at the Tree of Life Synagogue in Pittsburgh, Monday, Oct. 29, 2018, for peace, harmony and love to once again reign supreme upon this Earth. 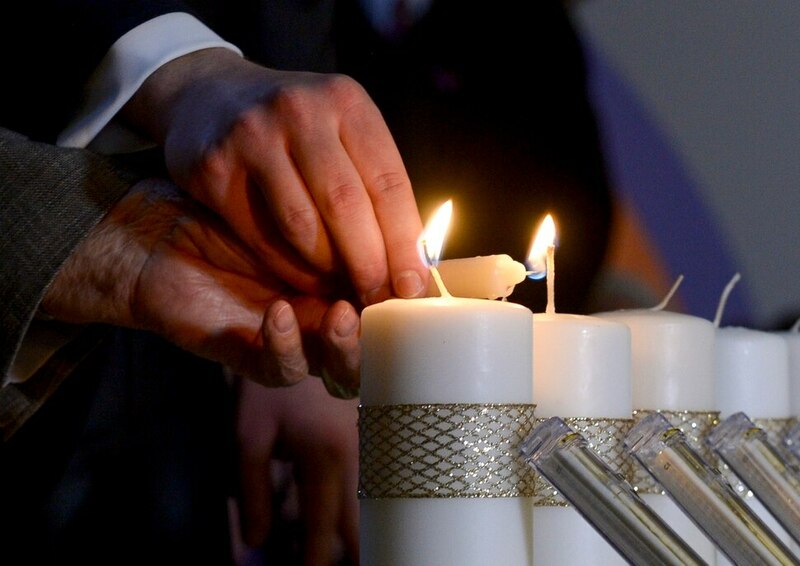 Leah Hogsten | The Salt Lake Tribune Eleven candles, representing those killed during Saturday's shooting at the Tree of Life Synagogue in Pittsburgh, were remembered during an interfaith service at Chabad Lubavitch of Utah, Monday, Oct. 29, 2018. Hundreds attended the vigil and prayer service to pray for peace, harmony and love to once again reign supreme upon this Earth. Leah Hogsten | The Salt Lake Tribune Flowers were left outside Chabad Lubavitch of Utah as members of Utah's Jewish and interfaith communities held a vigil and prayer service for the 11 people killed at the Tree of Life Synagogue in Pittsburgh, Monday, Oct. 29, 2018. 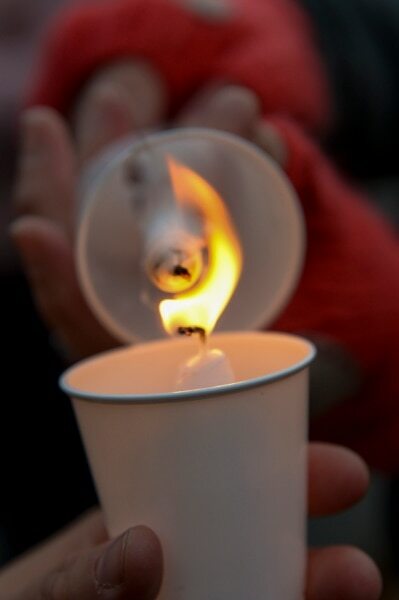 Leah Hogsten | The Salt Lake Tribune Candles are lit and prayers are given outside Chabad Lubavitch of Utah as members of Utah's Jewish and interfaith communities held a vigil and prayer service, Monday, Oct. 29, 2018 for the 11 people killed at the Tree of Life Synagogue in Pittsburgh, Monday, Oct. 29, 2018, for peace, harmony and love to once again reign supreme upon this Earth. Leah Hogsten | The Salt Lake Tribune l-r Jennifer Frahm, husband Walker and son Atticus join their fellow community members outside Chabad Lubavitch of Utah as members of Utah's Jewish and interfaith communities hold a vigil and prayer service, Monday, Oct. 29, 2018 for the 11 people killed at the Tree of Life Synagogue in Pittsburgh. Leah Hogsten | The Salt Lake Tribune l-r Bernadette LeRoy and Leslie Phillips join their fellow community members outside Chabad Lubavitch of Utah as members of Utah's Jewish and interfaith communities hold a vigil and prayer service, Monday, Oct. 29, 2018 for the 11 people killed at the Tree of Life Synagogue in Pittsburgh. Leah Hogsten | The Salt Lake Tribune Vaughn Lovejoy, center, joins fellow community members outside Chabad Lubavitch of Utah as members of Utah's Jewish and interfaith communities hold a vigil and prayer service, Monday, Oct. 29, 2018 for the 11 people killed at the Tree of Life Synagogue in Pittsburgh. Leah Hogsten | The Salt Lake Tribune Holocaust survivor Abe Katz is aided by Rabbi Avremi Zippel as 11 candles representing those killed during Saturday's shooting at the Tree of Life Synagogue in Pittsburgh are remembered during an interfaith service at Chabad Lubavitch of Utah, Monday, Oct. 29, 2018. Hundreds attended the vigil and prayer service to pray for peace, harmony and love to once again reign supreme upon this Earth. Leah Hogsten | The Salt Lake Tribune Candles are lit and prayers are given outside Chabad Lubavitch of Utah as members of Utah's Jewish and interfaith communities held a vigil and prayer service, Monday, Oct. 29, 2018 for the 11 people killed at the Tree of Life Synagogue in Pittsburgh, Monday, Oct. 29, 2018, for peace, harmony and love to once again reign supreme upon this Earth. Leah Hogsten | The Salt Lake Tribune Candles are lit outside Chabad Lubavitch of Utah as members of Utah's Jewish and interfaith communities held a vigil and prayer service for the 11 people killed at the Tree of Life Synagogue in Pittsburgh, Monday, Oct. 29, 2018. 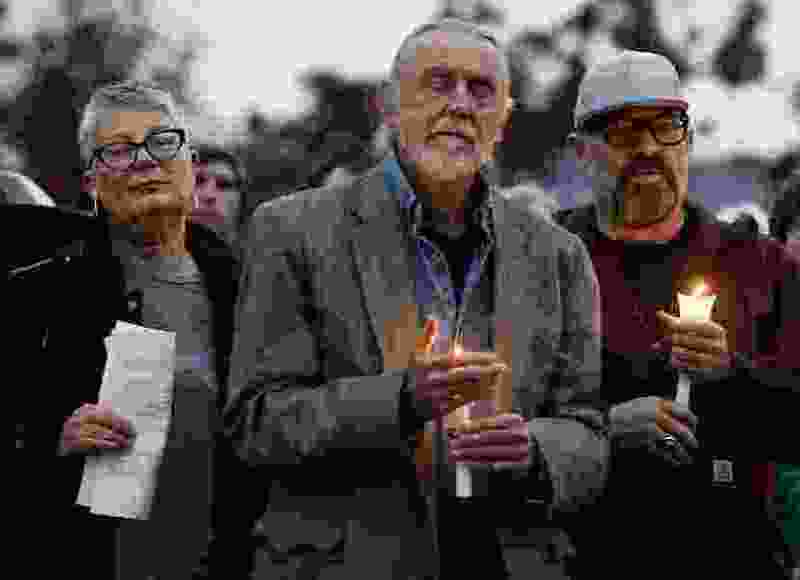 “This is how we respond to such a tragedy,” he told members of the Salt Lake Valley’s Jewish community and faith and government leaders who lit candles and held a vigil for the victims of the shooting Saturday at the Tree of Life synagogue in Pittsburgh, where members were celebrating a new baby in the congregation. Zippel said he waited anxiously as hours ticked by Saturday before he could call his son who attends a rabbinical school in Pittsburgh; orthodox tradition forbids use of phones and other digital devices during Shabbat, the Jewish day of rest. Zippel later learned that the seminary is less than a mile from the Tree of Life synagogue. The possibility of anti-Semitic violence in Utah was not lost on Vivian Dowsett, who joined mourners at Chabad Square as the group Mormon Women for Ethical Government linked hands and circled the building in solidarity. Lisa Kieda, a member of Chabad Lubavitch of Utah for nearly two decades, said she begins the high holiday services the same way each year: “I pray we’re all safe,” she said. The outrage of Saturday’s attack was intensified because of its location, she said. “Being in a house of worship — those people are gathered here in peace, to pray. It’s hate, it’s mental illness, and it’s guns,” she said. A number of Salt Lake City-area faith leaders attended Monday’s vigil, along with Gov. Gary Herbert, Rep. Chris Stewart, Salt Lake City Mayor Jackie Biskupski, Salt Lake County councilwoman and U.S. Senate candidate Jenny Wilson and other elected officials. “We are brothers and sisters regardless of some of the differences in our religious doctrine and understanding,” Herbert said. Abe Katz, a survivor of Auschwitz and Birkenau, lit 11 candles in remembrance of the victims of Saturday’s shooting. A vigil was scheduled in Park City shortly after the one at Chabad Square, and another vigil will take place Tuesday at Congregation Kol Ami.